Many of us are searching for that perfect day in sport. per·fect adj. [pərfikt] 1. having all the required or desirable elements, qualities, or characteristics; as good as it is possible to be. 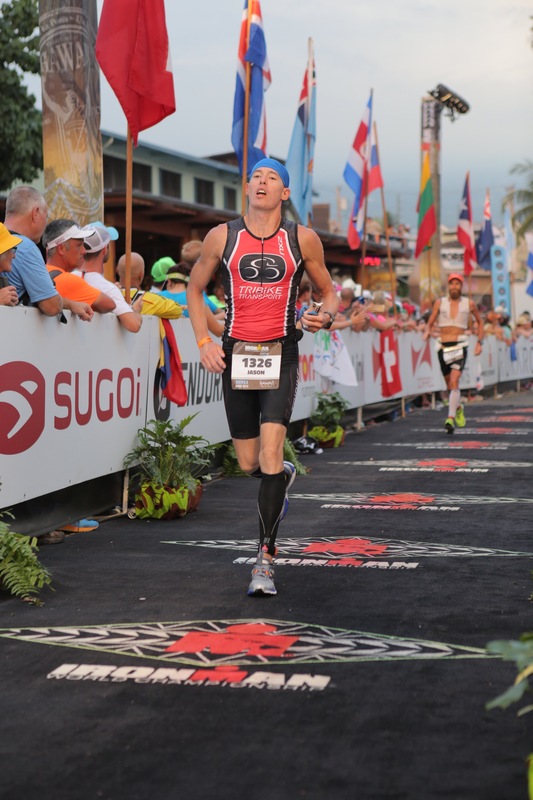 In many ways, my first Hawaii Ironman in 2014 was perfect. I had several goals, and when I look back on that day, I met them all. 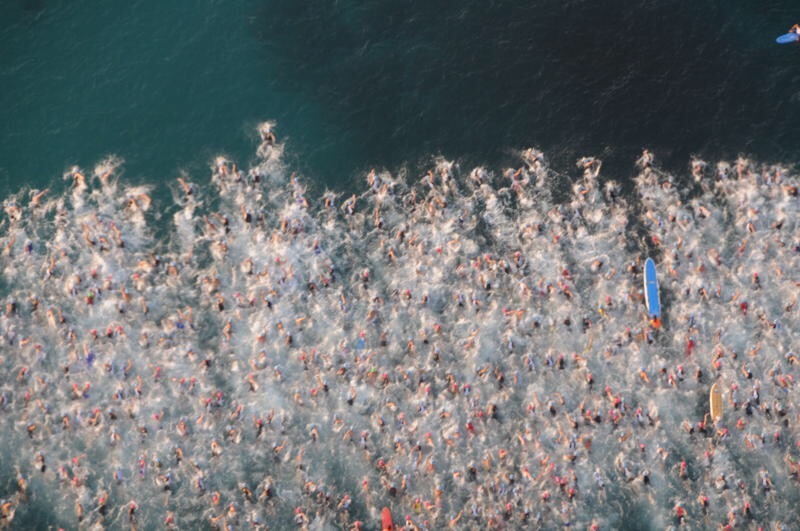 But the 2015 Hawaii Ironman would be different. This year my plan was not to finish. It was to race. 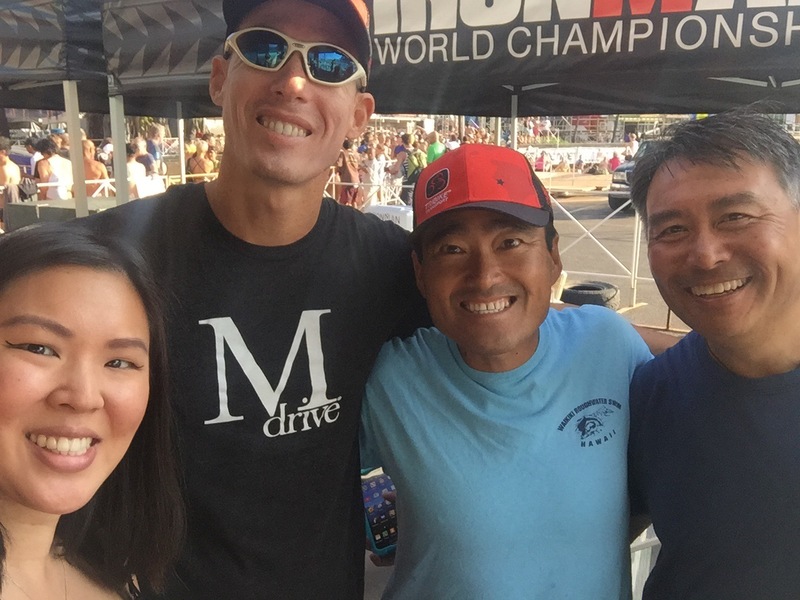 While several things went wrong, it’s possible that the 2015 Hawaii Ironman was everything I needed. 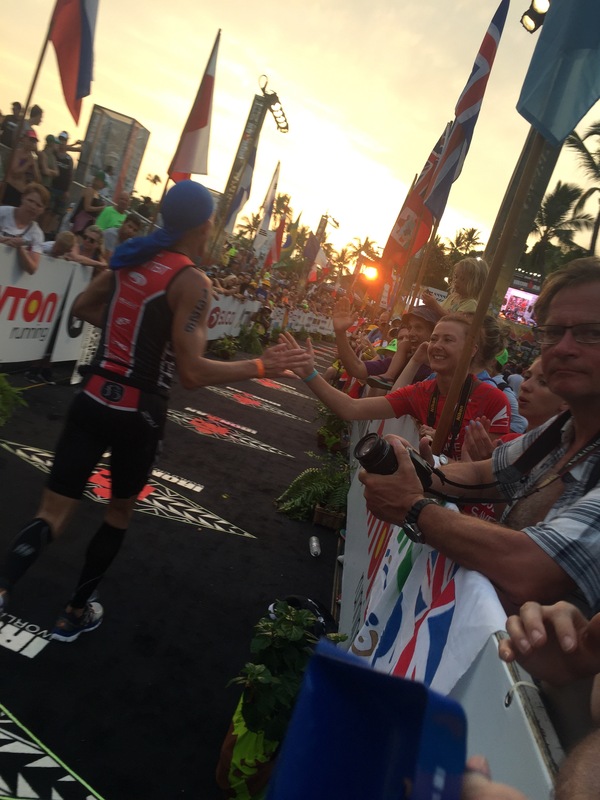 It’s possible that, at this time in my development as a human being, the 2015 Hawaii Ironman was perfect. 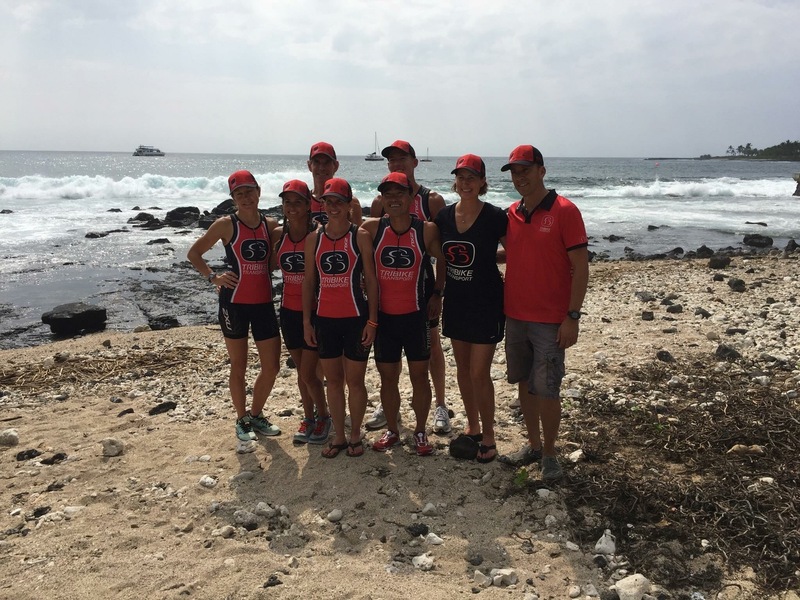 For over 10 years, I wanted to qualify to race in Hawaii. And when I finally qualified to race in 2014, beneath the layers of excitement and enthusiasm and passion was a little bit of concern. See, I know goals are good. They make us stretch. (They are dreams with a deadline.) But this goal had been a carrot for over 10 years. Once I attained it, what would compel me to lace up the shoes for a long run, spend a Saturday in the Pain Cave, or swim until my fingers look like prunes? Once you’ve walked on the moon, do you really need to go back? Sometimes the worst thing you can ever do is attain a goal. 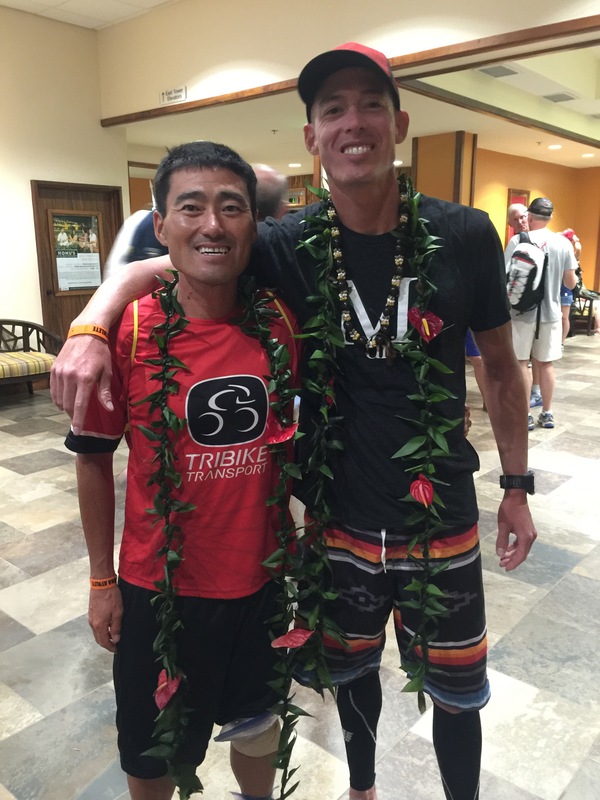 And that is precisely why the 2015 Hawaii Ironman may have been perfect. It revealed new reasons to train, new opportunities for learning, and new things to work toward. 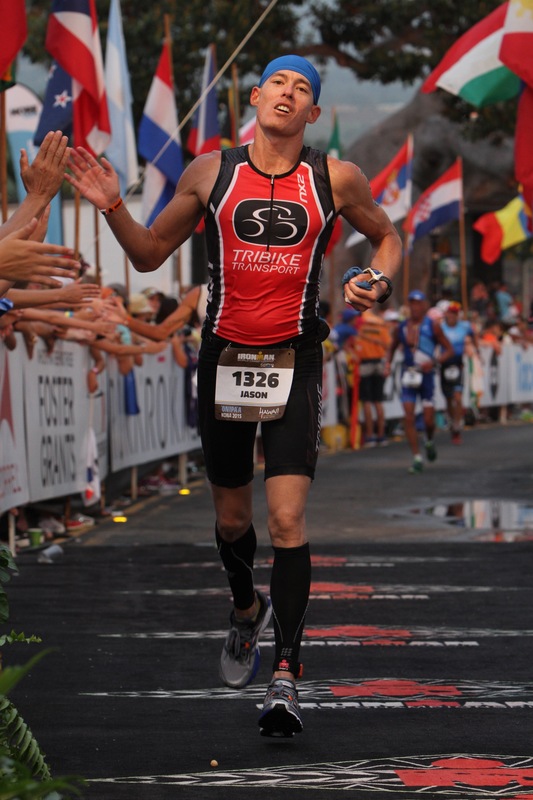 The 2015 Hawaii Ironman may have stoked my fire just enough to give me what I need to train and race well in 2016. 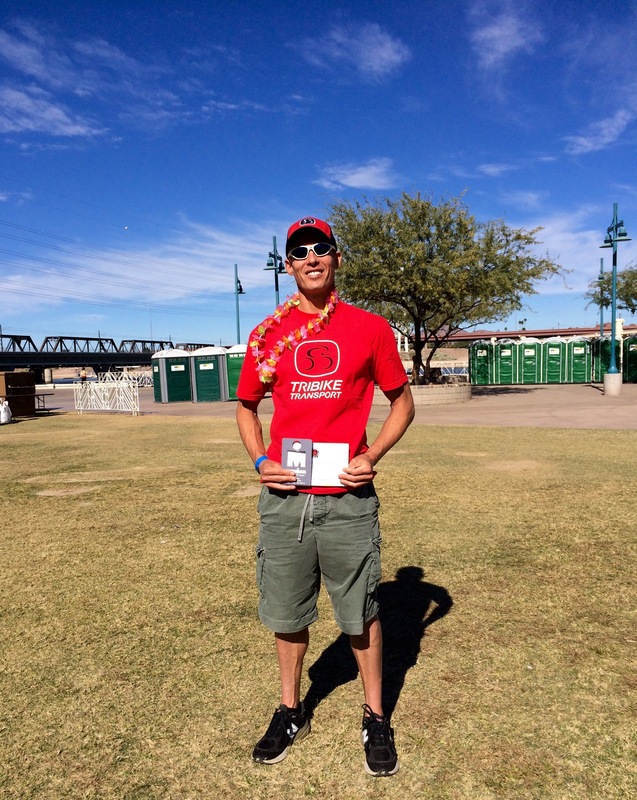 It all started when I qualified at Ironman Arizona. 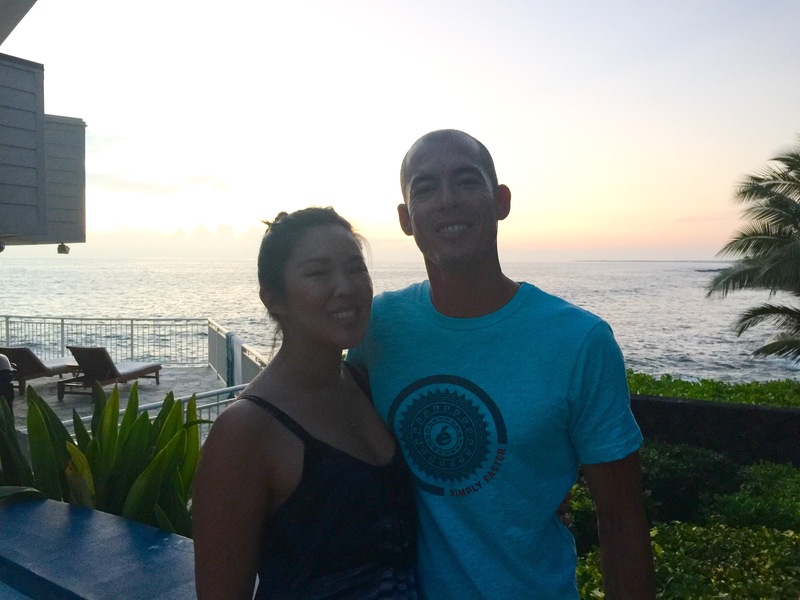 After punching my ticket in Tempe, I had 11 months to prepare for Hawaii. I spent a lot of time on this bike in this room (the Pain Cave), simulating hot and humid conditions by getting the humidity up to 88% and the temperature up to 95 degrees. (Train in a sauna almost everyday, and your body learns to work efficiently in the most sub-optimal conditions.) 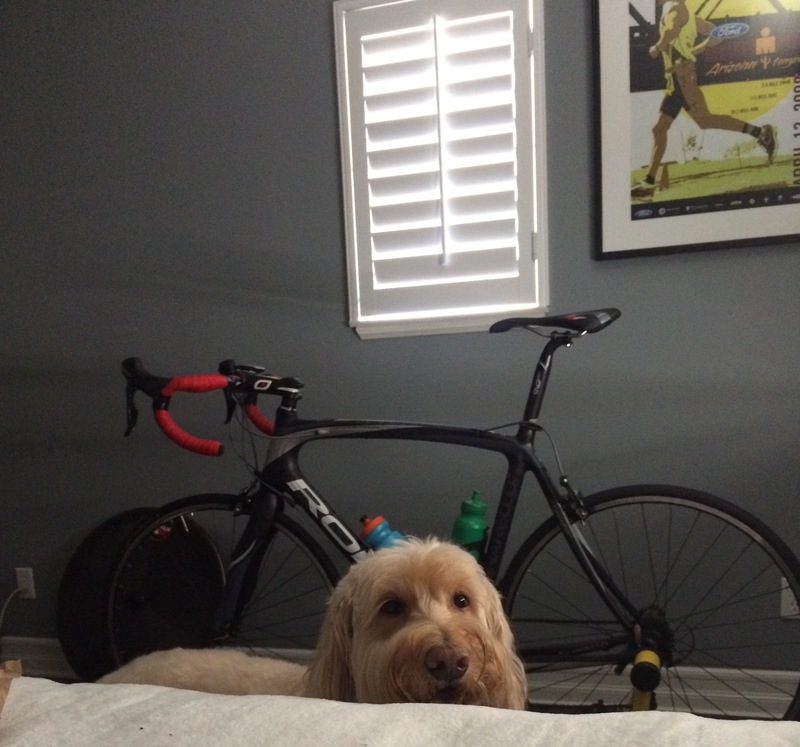 (And yes, I ask the dog to leave before I train. Anything else would be considered animal cruelty). So I made daily visits to the Pain Cave. 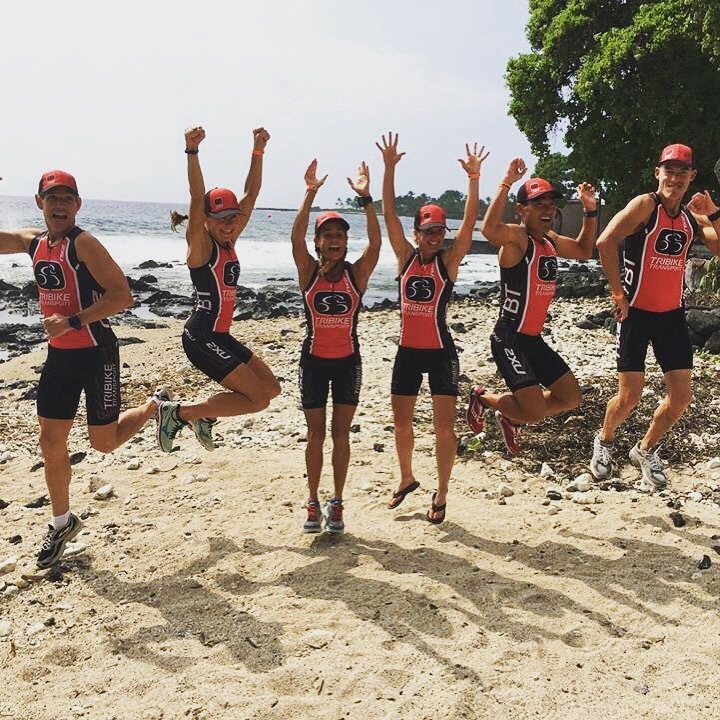 I did a training camp on the Big Island. 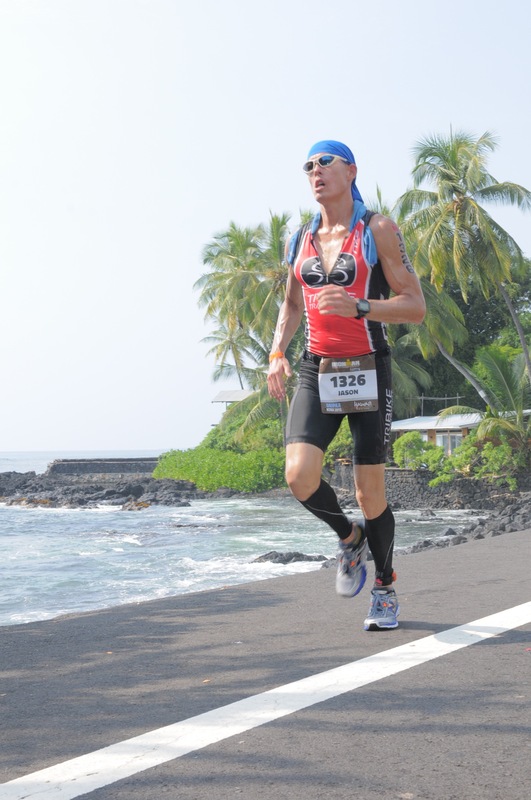 I raced in Puerto Rico, Boston, Texas, and Japan. 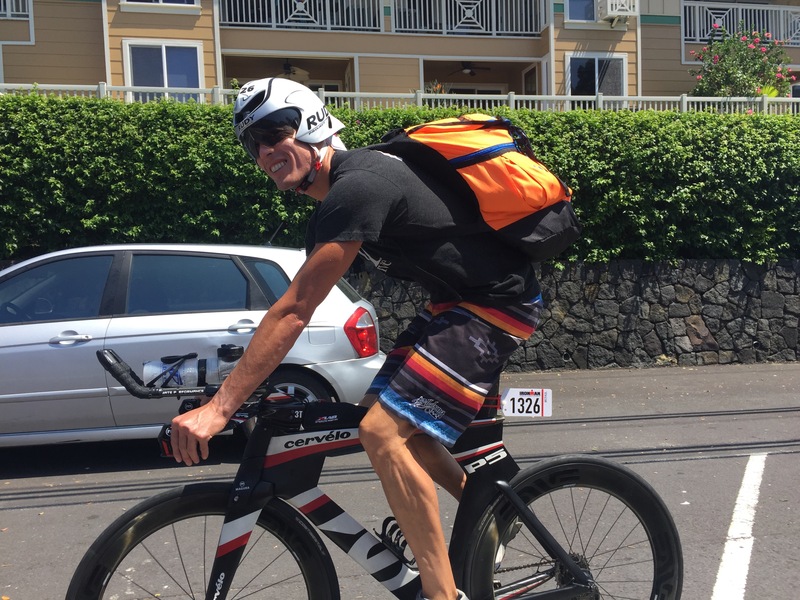 I logged fairly high volume until about 7 days out, when I initiated a crash taper, making sure to get a lot of extra sleep in the days before departing for Kona. 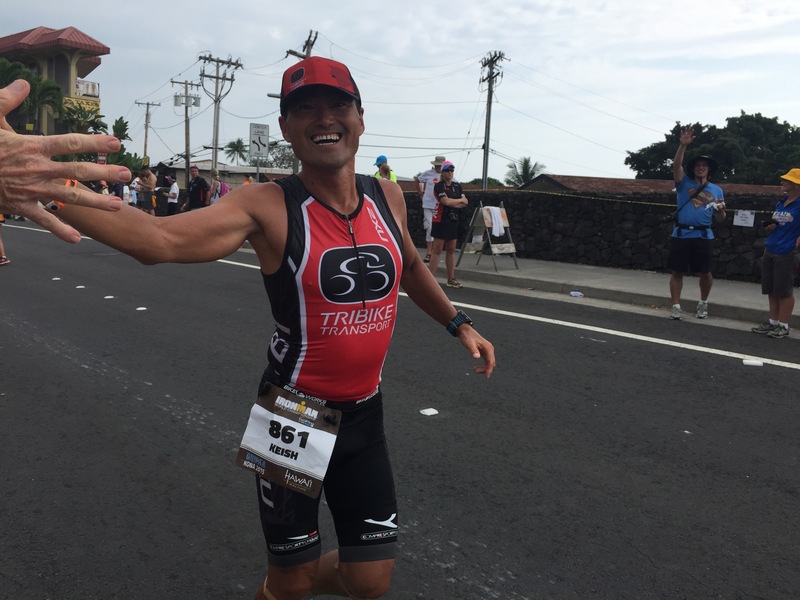 While my training endured many ups and downs, I arrived in Kailua-Kona fit, confident, and ready. It wasn’t going to be like last year when I took it out conservatively. 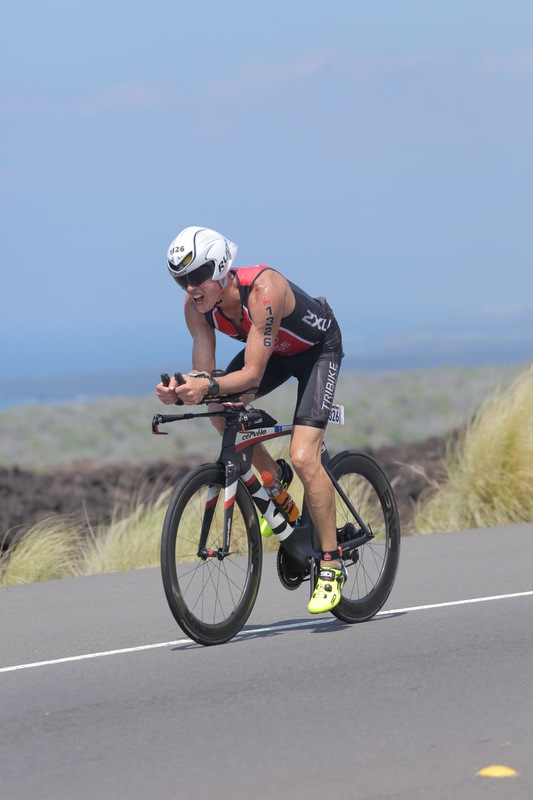 In fact, perhaps due to the high heat and humidity in the Pain Cave, when I landed in Kona and was hit by what some consider a hellish Big Island wind, it embraced me like a cool breeze. I arrived on Tuesday, four days before the race. Keish and I swam each morning from the pier. 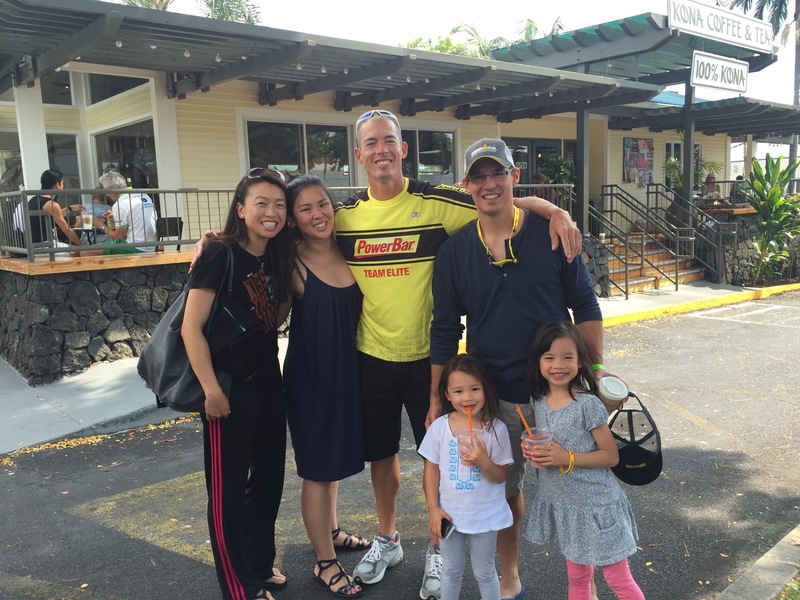 One day we ran into our friend Annalee Akagi. The next day Michelle arrived, and we also met up with our good friend Conrad. Then Keish and I went over to the expo to take photos with our TriBike Transport teammates. If you have to travel for a race, and if TriBike Transport is transporting bikes to that race, do yourself a favor: send your bike via TBT. 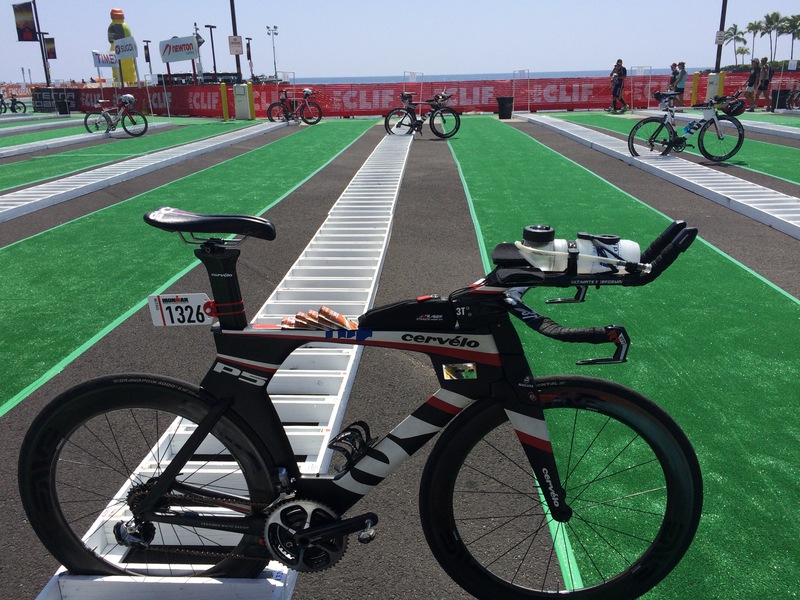 If you need a reason, just read my race report on Ironman Japan, where seven weeks ago the TSA at Los Angeles Airport did their best to disturb, breach, and compromise the structural integrity of my bike. Now, back to race week. People sometimes ask what I eat in the days leading up to an Ironman. 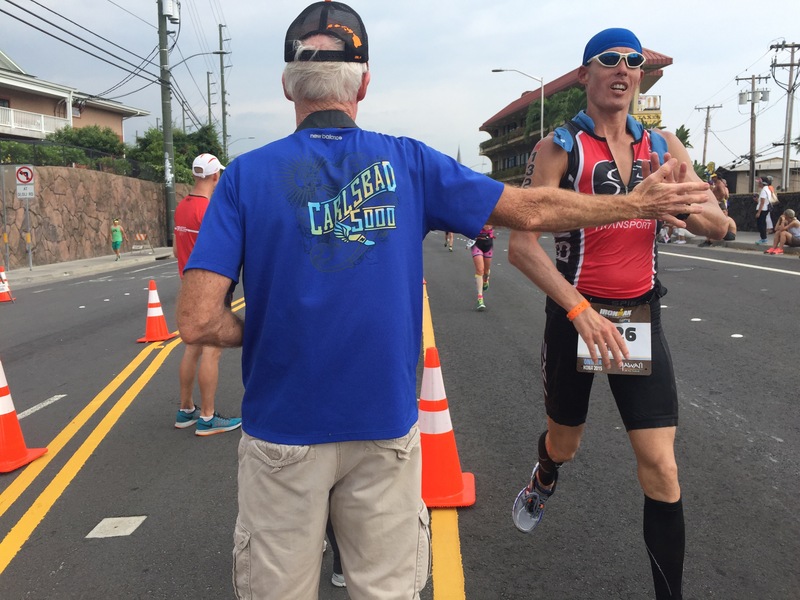 Primarily, because I reduce my training volume during race week, my nutritional goals are to stay healthy, keep from gaining weight, and make sure I get the right amount of fat, protein, and carbs. 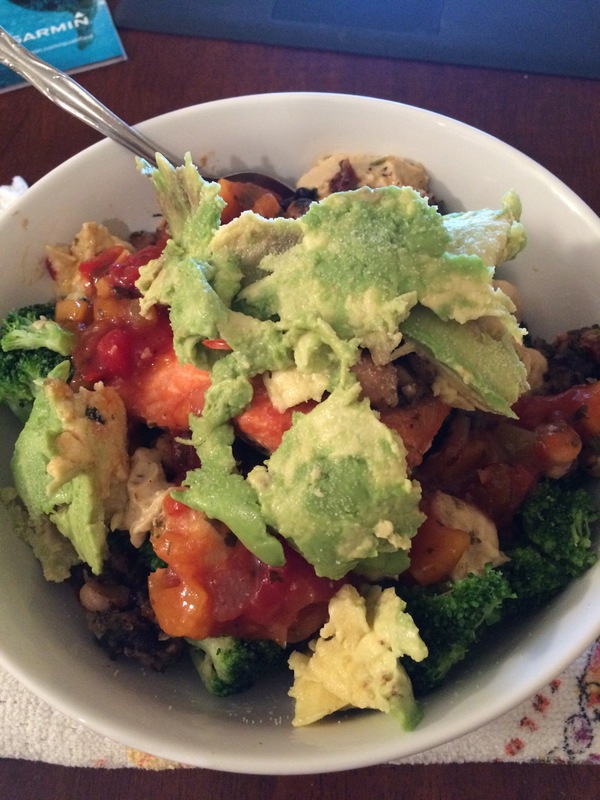 In the days leading up to this race, I mainly ate wild salmon, broccoli, hummus, salsa, avocado, and a Mediterranean bean mix (they sell it at Costco). Friday morning came fast. We went for a quick swim. I ate two anpans to carbo-load (anpans are sweet rolls filled with red tsubushian sweet beans). The ones I like are from Punalu’u Bake Shop, which is located on the Big Island. It was now onto bike drop-off. I was lucky to be one of the first people to check in. 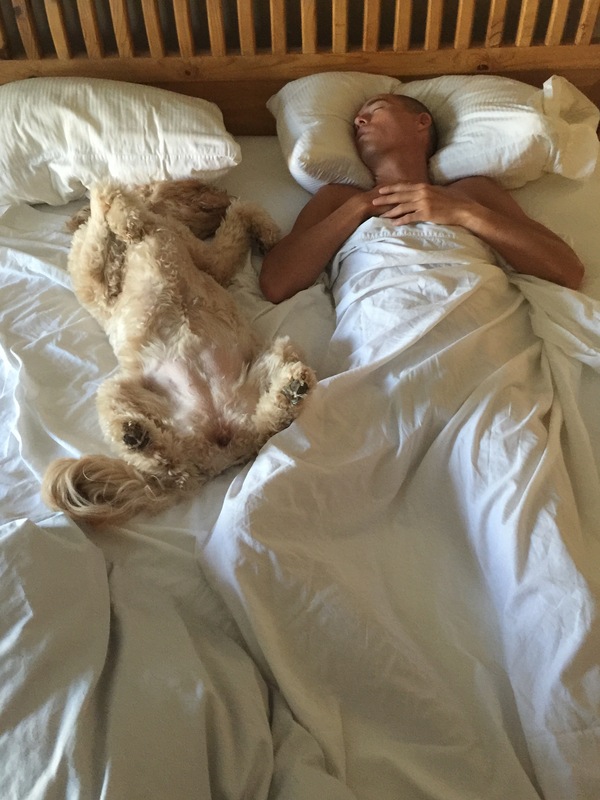 We went to sleep around 6 pm, as I like to rise early on race day. It wasn’t long before my alarm sounded. 2:30 am. Time to begin the day. On race morning, I drink a lot of coffee, do many activation exercises for my glutes, adductors, and lats. Once we arrived at body marking, the tension was visible. But I was happy. I was excited. I was, in many ways, the complete opposite of how I must’ve acted and appeared last year. I’m a bit more relaxed. Here, Keish and I are about to enter body marking. I ran into my teammate and friend Kyle Welch before the race. 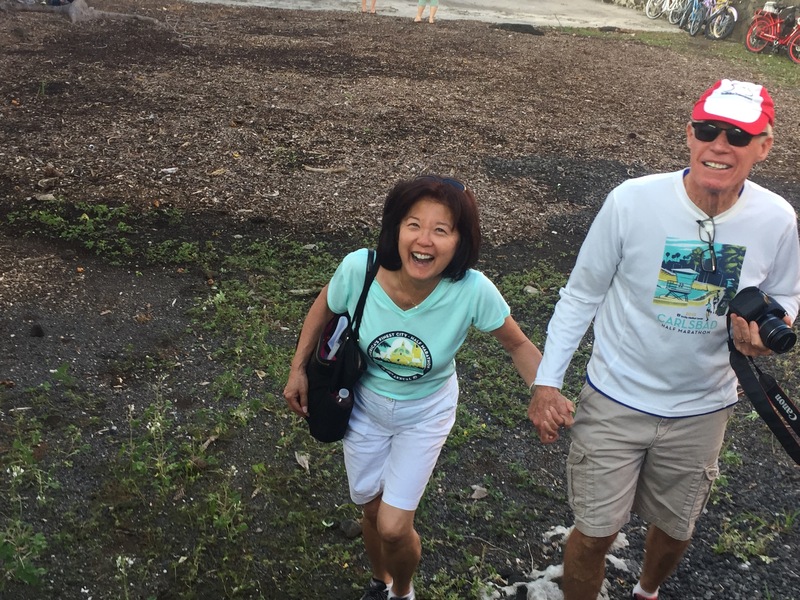 Michelle’s parents flew all the way out for the race! And of course, the love of my life. She is always there for me. Okay. Enough photos. It was time to transform. Keep the attitude right where it is, but start to embrace the fact that today will hurt. There will be pain. Things will go right. Things will go wrong. And that’s racing. You begin the swim by treading water for 15 minutes before the cannon fires. Treading water. It sounds awful, but it’s not. It’s glorious. The water, although murkier than last year, is still turquoise, clear like an aquarium. If someone told me you have to tread water for 15 minutes before swimming 2.4 miles, I’d think it sub-optimal at best. But the truth is, the ocean is part of the course. And you want to get on the course as soon as possible. You’ve been itching for this race to start. (For some of us, we’ve been wanting to be here for over a decade.) 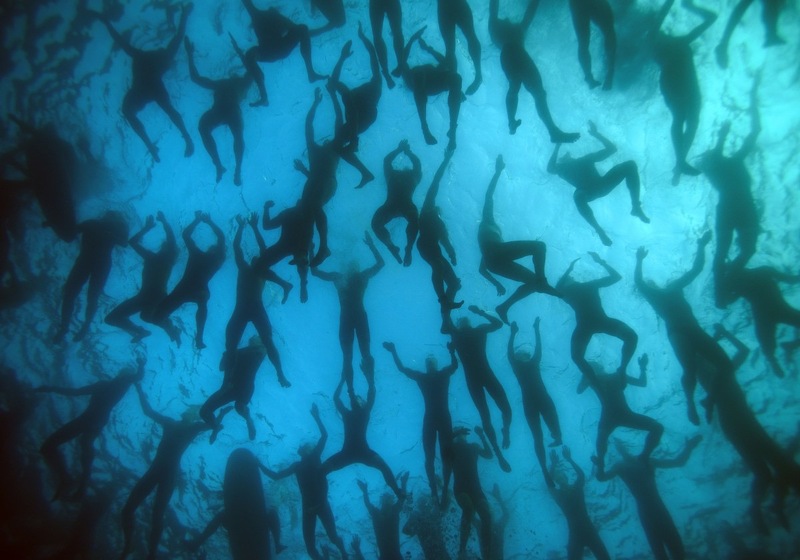 So treading water becomes an invitation. 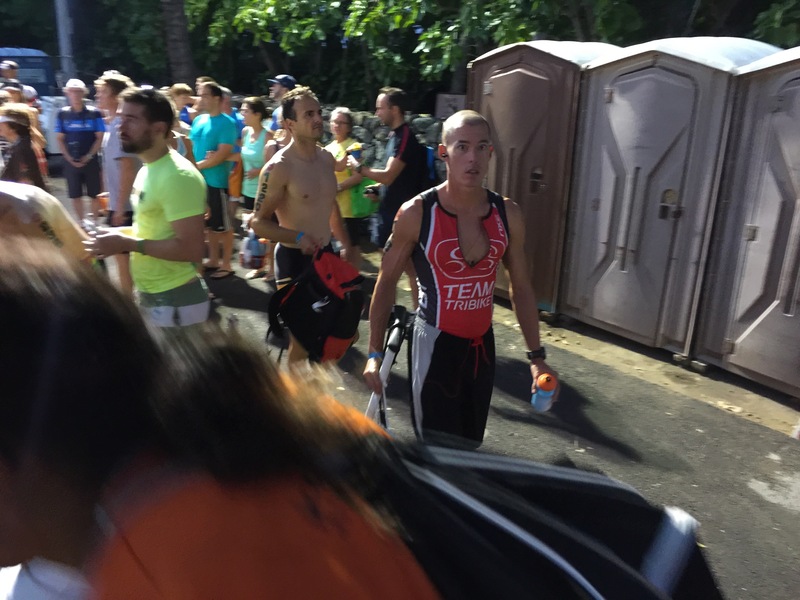 Treading water for 15 minutes before the start of the Ironman World Championship is an honor. Last year I was a bundle of nerves. A basket case. This year, however, I was eager. I was excited. I wanted the cannon to boom. The cannon fired, and we were on our way. Unlike last year, when some yahoo kept grazing the bottoms of my feet with his fingers, this year was mainly free of any contact. In retrospect, I could have gotten on the feet of this dude in black speedos, as he was next to me all the way to the turnaround. When we reached the turnaround, I was able to sneak a quick look at my watch. It read 30:10. This was most excellent, and I started to do the math: if we assume the outbound leg was current-assisted, and if on the way back I went a wee bit harder — presumably against the current — then I’m looking at something between a 59:00-1:03. This would set me up nicely. 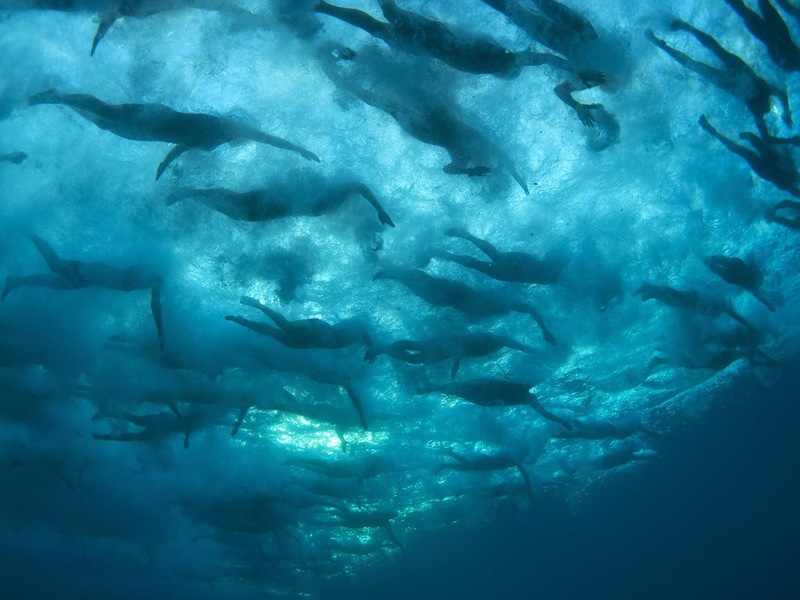 So I swam hard on the way back, and due to the time vortex I typically enter when swimming open water, I didn’t know if the return leg took me 25 minutes, 30 minutes, or more. As I exited the water and ascended the carpeted stairs, I saw 1:11. Wow! That was a much bigger number than I expected! It took me 30:00 to get to the turnaround, but it took me 41:00 to return. I had no idea it was taking so long on the way back. But there was good news: I was not upset. I didn’t get frustrated or down on myself. Instead, without making a conscious effort to determine my attitude, I simply thought: “Well, that’s racing. Just go forward. Get on your bike”. (I’m so intrigued by this, as I think I may naturally be a bit more negative than positive, and normally I’d have to give myself what Zig Ziglar would call a “check-up from the neck up”. But today something fairly magical was occurring with my attitude, and — in looking back on the day — it made a huge difference. I’m reminded of Frost’s concluding lines: “I shall be telling this with a sigh / Somewhere ages and ages hence: / Two roads diverged in a wood and I — / I took the one less traveled by, / And that has made all the difference”). When I got onto my bike, my legs felt fresh. This is important, as it’s really tough to know if you nailed the taper until you feel your legs press down on the pedals. Sometimes they feel mushy, sometimes they feel fatigued, sometimes they’re alright, and sometimes they feel great. Today my legs felt phenomenal. I took out the first bit on Kuakini at a reasonable effort. I wasn’t hammering just yet. I also found myself giving each athlete a little more respect than necessary. (I tend to do this by respecting the 5 bike lengths you’re supposed to allot between the person’s bike in front of you, and your bike). However, after riding like this for a few miles, Keish overtook me. Keish is a former bike racer. 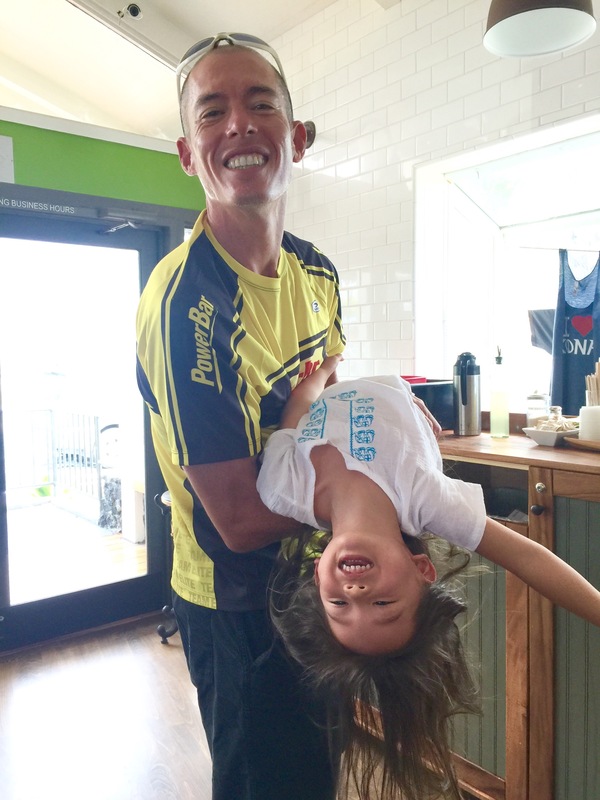 And today he was teaching a class on racing the Hawaii Ironman bike leg. He’d overtake one racer, swerve into the next guy’s draft, and then slingshot past him. It was poetic. And it was smart racing. Further, it was legal. I’m still such a tourist. I’d been busy thinking, “How am I going to legally overtake the 200 people in this long line in front of me?” Keish didn’t bother thinking about that. He overtook each person, one racer at a time. And so, as if Keish were Sean Connery’s character from The Untouchables, I heard “Here endeth the lesson”. And as a dutiful student, I began overtaking the people in front of me. One racer at a time. Eventually, this included Keish, whom I enjoy passing because I suspect it may make him go harder, and I know having him at my back compels me to go harder. 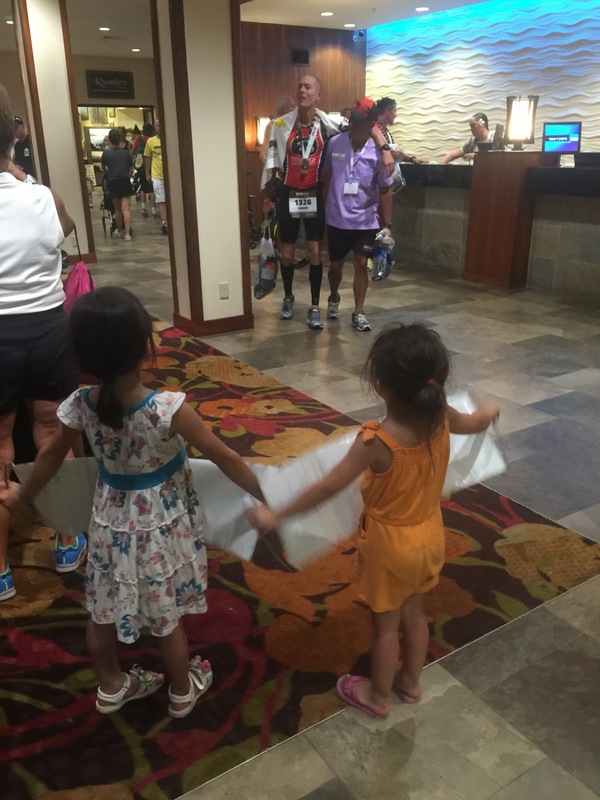 Last year the winds were fairly severe in Waikoloa (around Mile 35 of the bike). But this year they were tame. 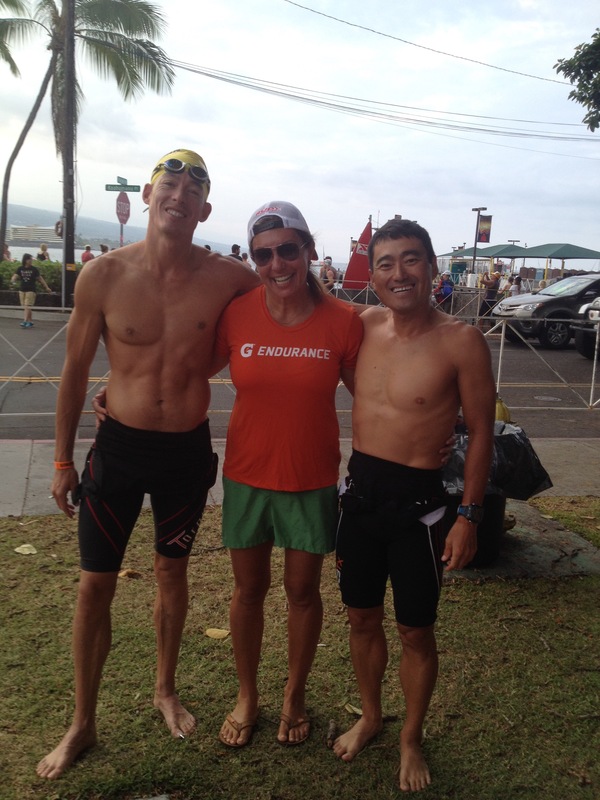 Further, Madame Pele seemed to be extending her generosity through the end of the Queen K and up through Kauaihae. 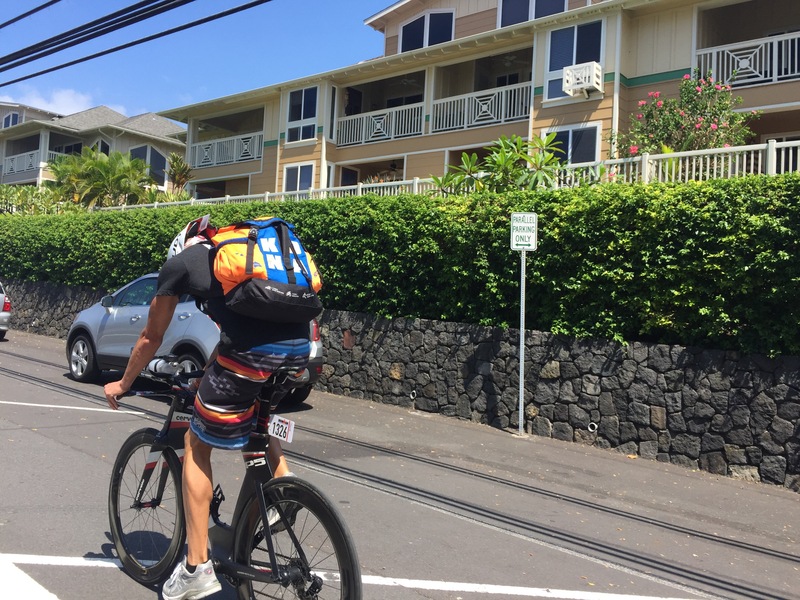 I was pushing about 70% of threshold, but I knew I could ratchet it up a notch or two once we ascended the hills of Hawi, especially since a nice rain blanketed us during the climb. I changed the flat in under 4 minutes, and pedaled fiercely in an effort to overtake those who’d just overtaken me. The next 10 miles were fast. 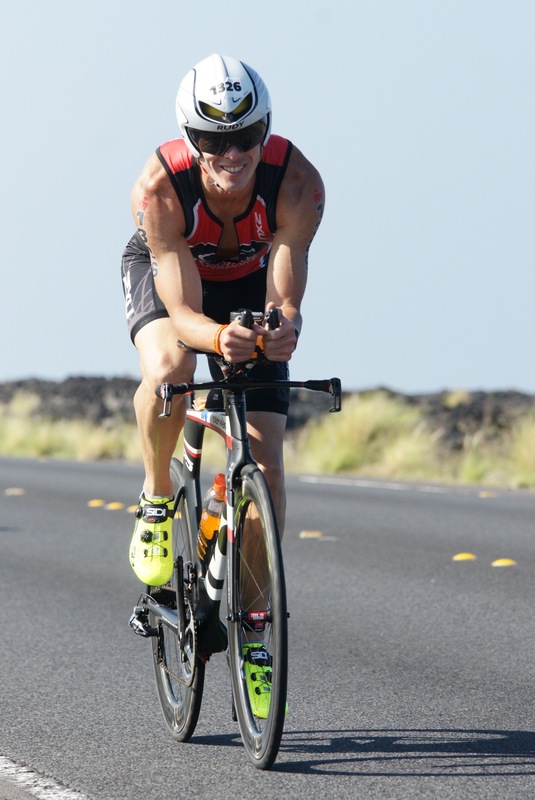 And then, at Mile 75, as I was finishing the final climb out of Kauaihae onto the Queen K, I attempted to shift gears. Nothing happened. So I tried again. Nothing. For some reason, my Di2 (electronic shifting) was getting no juice. I pulled to the side of the road, removed the wires from their ports, plugged them in again, and . . . nothing. I was in the “granny” gear. My chain was in the small ring up front and in the 28 in the back. It was the ideal gearing for a climb up Haleakalā. But for anything flat, downhill, or slightly uphill, I’d spin out. I was bewildered, and if not for my helmet I’d have scratched my head. The good news is that I didn’t have a choice. Had I a bad attitude, one choice would’ve been to drop out. To quit. To hitch a ride home. But that never crossed my mind. All I heard was a voice in my head say, “Well, it’s gonna take you longer than planned to finish this race”. And that was it. That’s racing. It’s like what Keish says: “When you race a lot, this stuff happens. It’s all part of racing”. I mounted my faithful non-shifting steed, and I pedaled a cadence so high it might be likened to the spinning legs of Speedy Gonzalez, the Road Runner, or perhaps Fred Flinstone as he starts his car. I was averaging a cadence of 125 (normally it’d be 88-90), and my speed dropped from 22-24 mph to an egg-beating 12 mph. I made several attempts to flag a mechanic, and on two occasions I pulled to the right to have my shifting issue examined. The first mechanic was supportive but unable to help. He radioed ahead to the Bike Works vehicle, and let them know I was in need of assistance. I got back out onto the road, spun my legs like a whirling dervish, and found the Bike Works van about 30 minutes down the road. There was a line. 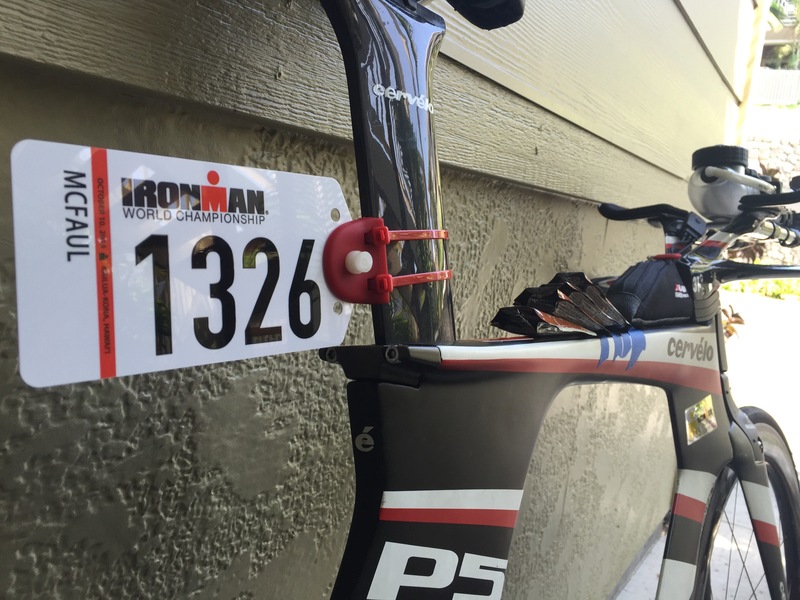 When Jason pulled three small wires from the bike stem, the problem was evident. One of the wires was severely crimped, almost severed. This is likely what was keeping the components from shifting. I’m fairly confident that I know how this happened, but I’ll not point fingers. In the end, it’s on me. But I will say this: it was not my local bike shop, East West Bikes. The owner, Eric, has gone above and beyond to help me right my machine this year. He has spent long, dedicated hours in the process, and I know this mechanical issue was not a result of his work. So there I am. 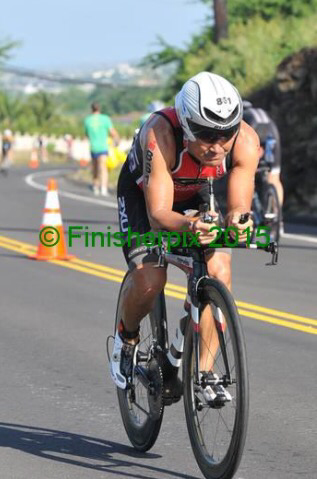 On the side of the Queen K. There’s a headwind, the humidity is high, and the temperature is a hot 90 degrees. I ask Jason if he can somehow get me into another gear. After all, I’m basically riding a fixie, but I’m fixed in the easiest, lowest power-generating gear. Fortunately, Jason was able to softly “force” my chain down into the middle of the rear cassette. I was still in the small chain ring up front, but at least I’d be able to apply some force with each pedal stroke. I bid him adieu, thanked the volunteers, and attempted to hammer the final 30 miles back into town. I’d be glossing over the facts if I didn’t acknowledge the frustration I faced during those final 30 miles. When there was a headwind and a false-flat, I could push by the racers in front of me. But due to gearing, they’d overtake me on the descents. I could sense that some of the racers were looking to their right, seeing my spinning legs, and thinking “That guy should shift”. But when it counted most, my attitude was intact. I didn’t care what others thought. I didn’t care how I looked. I just wanted to make it to the bike dismount line so I could begin the run. And when I finally made it into town, an hour later than expected, I chuckled. 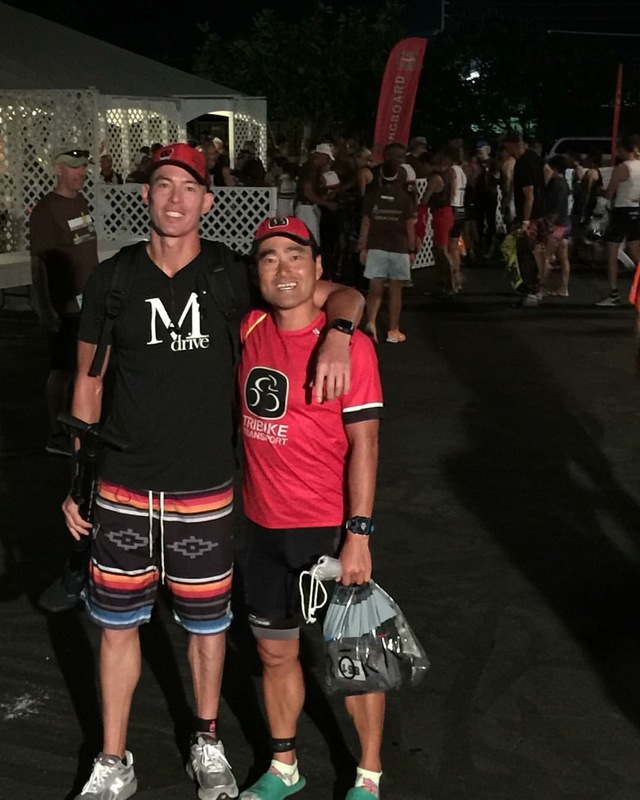 The mere notion of running a marathon after riding 112 miles is comically dichotomous. But that’s what you train for. If you can take it, you can make it. So you shove a cupful of ice down your shorts, employ every cooling trick you know, and begin a hot, oh so hot, marathon. I knew that the first 5 miles on Ali’i Drive were crucial. So I took them out at a fairly expeditious pace. I saw Coach Patrick McCrann on the way out. (He was on his way back, probably 7 miles ahead of me.) Last year he beat me by one second. This year I’d need to maintain my pace, and he’d need to fall apart for a mile or two if there was any chance of catching him. So I kept pushing, hoping that the chills I felt were not going to become anything more serious. Heat exhaustion would keep me from finishing well . . . if at all. So I tried to be gutsy yet careful. Determined yet diligent. 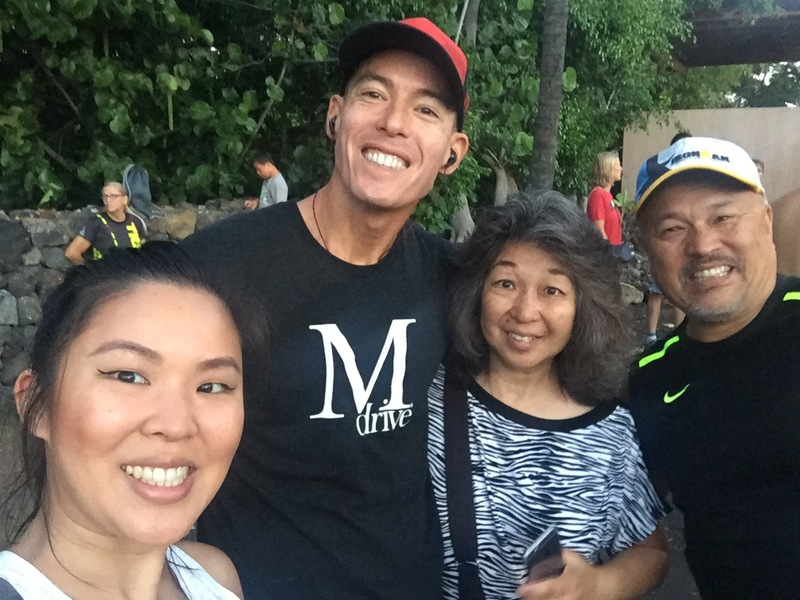 When you have chills, when goosebumps gather on your arms while running under the Big Island sun, it’s natural to be afraid of what might happen. But as they say, “The only time you can be brave is when you’re afraid”. So I trudged forward, knowing that once I made it to the turnaround, I might be able to take advantage of the descents. I might even be able to glide. For me, those first 10 miles are like dancing with a yeti. It’s just so easy to stop, to quit, to live to fight another day. The key is, I know this about myself. Sometimes what you know about your own predilections is precisely what prevents you from going down the path you know, deep down, is not the right path for you. It’s like Dorrito’s. Of course you want to eat one. I want to eat the whole bag! But the pain I must endure from abstaining is nothing compared to the pain I’ll feel if I choose the box marked “instant gratification”. The key is to delay it. Just for a little while. Trust me, the result is an accumulated gratification. In it, you can taste the difference between fresh-brewed and microwaved. It is the difference between something hard-fought and something given to you. Earn the reward. Any connosieur of a life well-lived will tell you, joie de vivre is not material but metaphysical. It resides in each of us. But we must run toward it. We must catch it before it slips away. And that is why I didn’t walk. 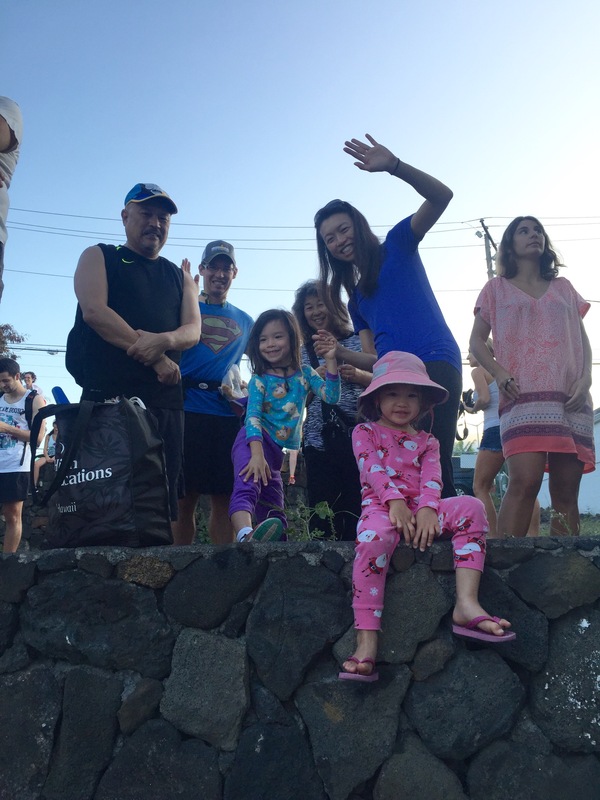 Of course, once I made it to Palani, once I saw my family, I did stop. For a moment. To kiss Michelle. And to high-five my nieces. 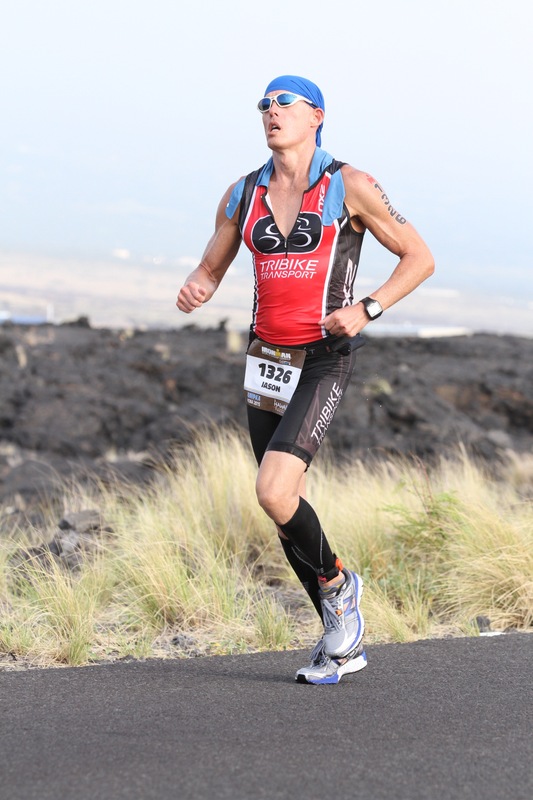 And then it was time to boogie on up the climb until I was face-to-face with the desolate, black lava-rock oven known as the Queen K.
There are races where the spectators fully encircle the run course. They stand five deep, trying to catch a glimpse of their rockstar, their A-list actor, their warrior poet. 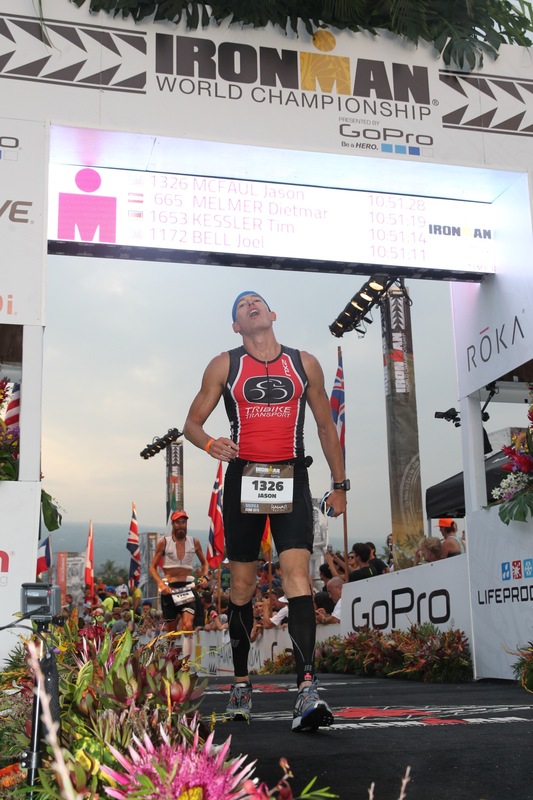 (I’ve experienced this at Ironman Frankfurt and Ironman France.) 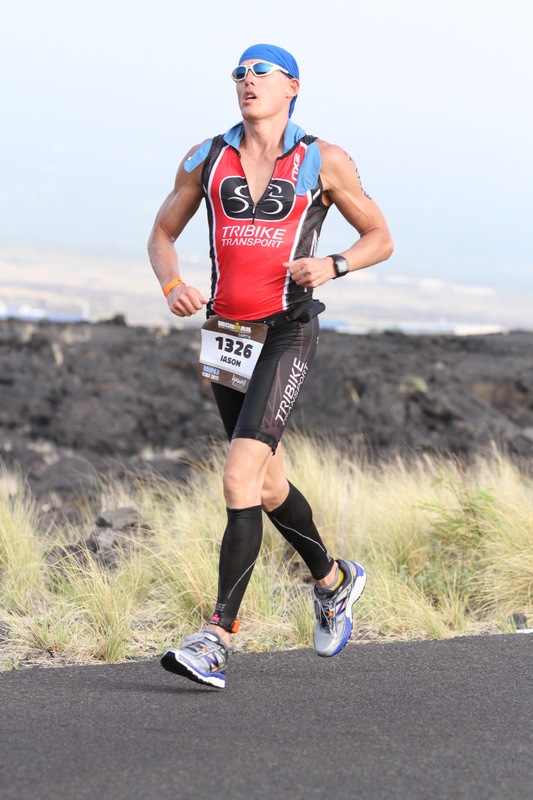 But at the Hawaii Ironman, once you make that left turn onto the Queen K, you are not Spartacus or Commodus. You are Gladiator. Or perhaps, as referenced in the movie by the same name, you are even more nondescript. Your name is Spaniard. If you find solace in crowd support, if you feed off of cheers, whoops, and hollers, if you run well when everyone is watching . . . then the Queen K will test your resolve. 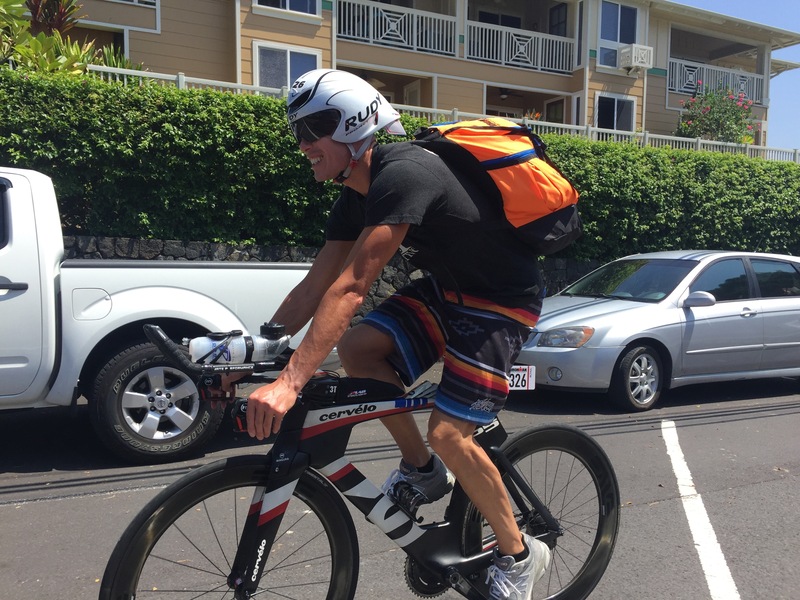 There are very few people on the Queen K, except athletes. You hear a helicopter in the distance, you see ambulances pass as they enter the warzone, but you are alone. It is just you, with your body and your mind. No distractions. No escape. 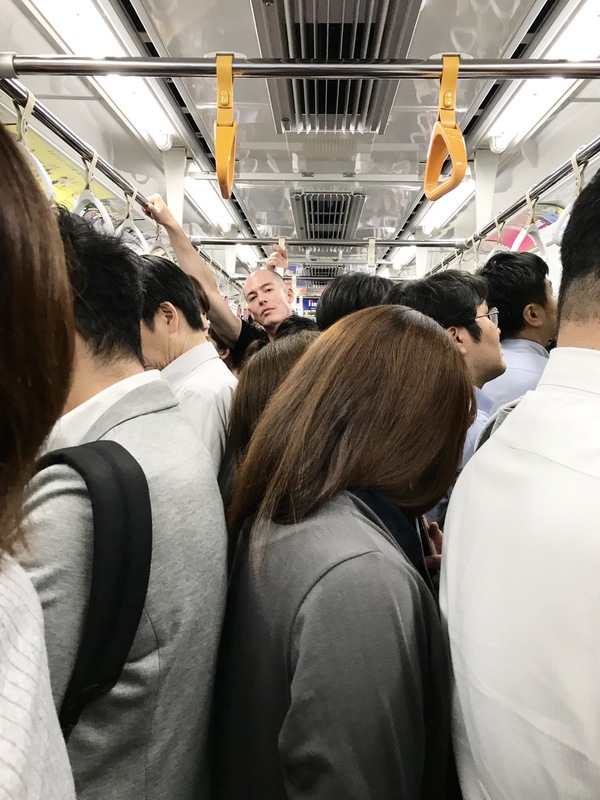 I prefer the crowds. I prefer the distractions. But the Queen K is the great equalizer. 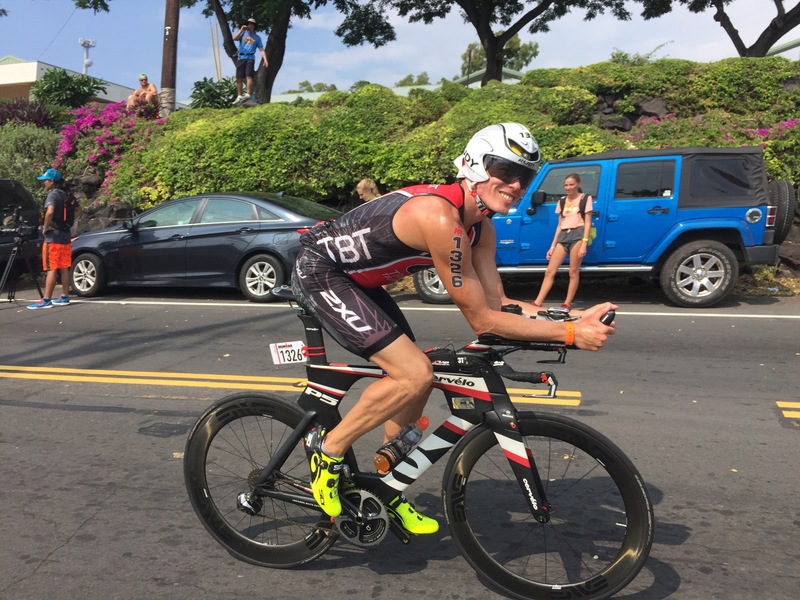 You might be Sean Astin or Gordon Ramsey (both received celebrity slots for this year’s race), but on the Queen K you are just another guy. What distinguishes you from the others on this quiet, post-apocalyptic stretch of highway, is your ability to hear your own words of encouragement while keeping the negative voices at bay. Evidence of this is everywhere. Some people are walking, and some people are sitting, defeated, with their heads between their legs. Others are running. Some run effortlessly, but most of the runners are trudging along, wrestling their way to the Natural Energy Lab, where it is 130 degrees. This is mental. And that’s why you do it. It’s not the physical test. Our bodies can do far more than we believe possible. But our minds! The levels to which we circumscribe our abilities, quash our human right to strive for something great, this is the mistake I’ll not make today. And so it could be 130 degrees in the Energy Lab, or it could be 200 degrees. I’ll perceive it as I must so I can make it. And that is precisely what will help me go forward. As I descend into the Energy Lab, I look for Coach Patrick, Steffen, Rob, Russ, Jose. I don’t realize it yet, but they will all beat me today. Mile 18 is approaching, and my plan is to attack, to turn myself inside out for the final 8.2 miles. Mentally, I know what to do. Physically, my body refuses to go harder. I push, but my leg turnover is just high enough to preserve my average pace. I want to run 6:30/mile, but my body returns just enough to hold 8:00/mile. Sometimes this game is such that your mind gives way long before your body. Today, however, my mind was hungry for more than my body could provide. I suppose that’s what fuels the journey. Just knowing that your body and mind may one day be aligned at Mile 18, that is an invitation to don a red cape. 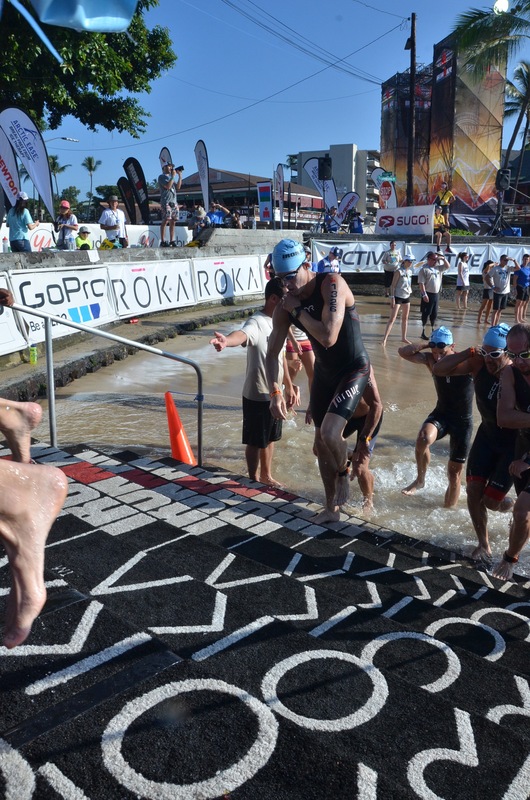 It is an invitation to be a hero, as one sponsor, Go Pro, has aptly noted on banners throughout the race course. Once you turn onto Kuakini, you’re almost home. My dad was there. Keish was not far behind. In the end, all of this . . . the musings, the philosophies, the lessons . 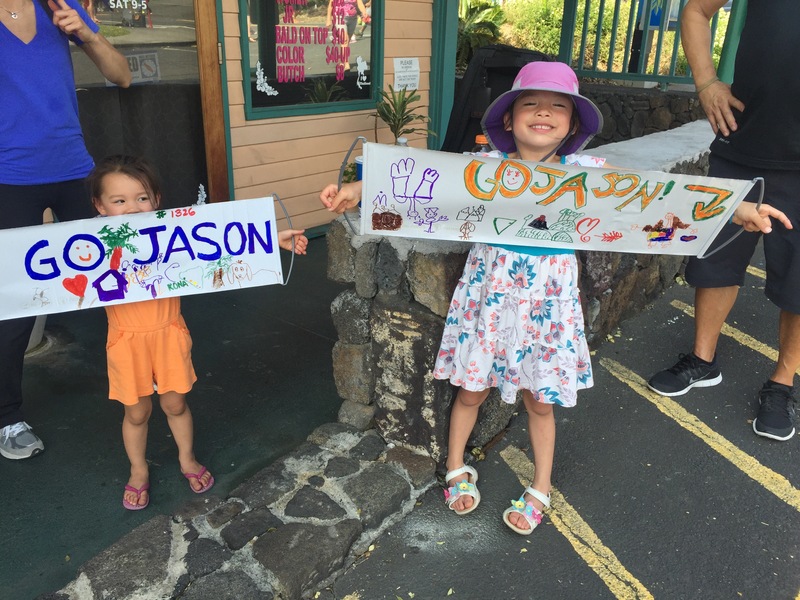 . . they can’t upstage the final turn from Hualalai onto Ali’i Drive. It is all of your Christmases wrapped into one. It is the fountain of youth. 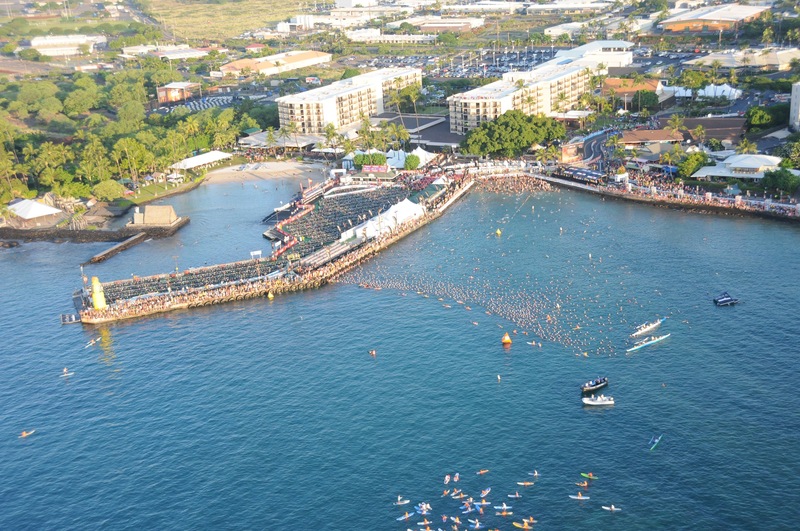 It is the finishing chute for the Ironman World Championship. 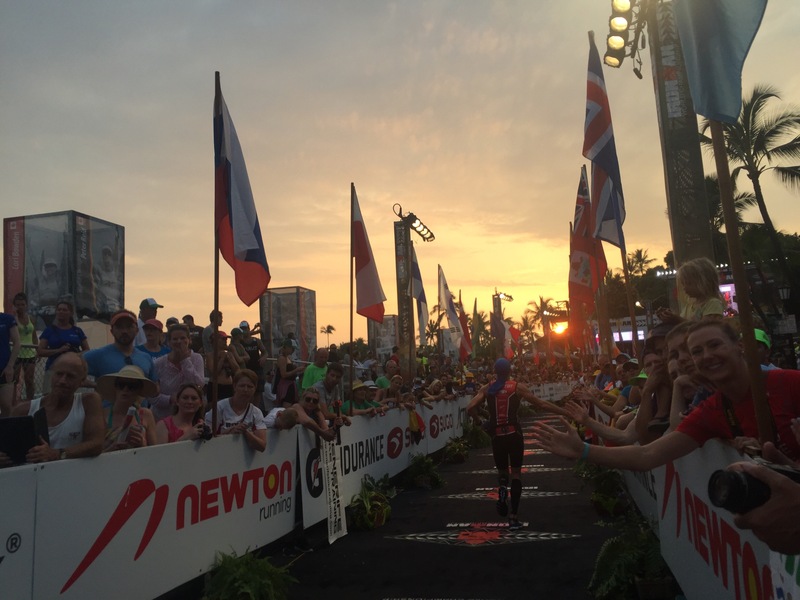 When you cross the line, the cheers from the crowd, the man on the microphone, the music from concert-sized speakers . . . they all form a soft, white noise, and you feel the overwhelming sense of peace and calm that come when exhaustion meets accomplishment. Looking back on the day, now that two weeks have passed, I don’t feel the pain. 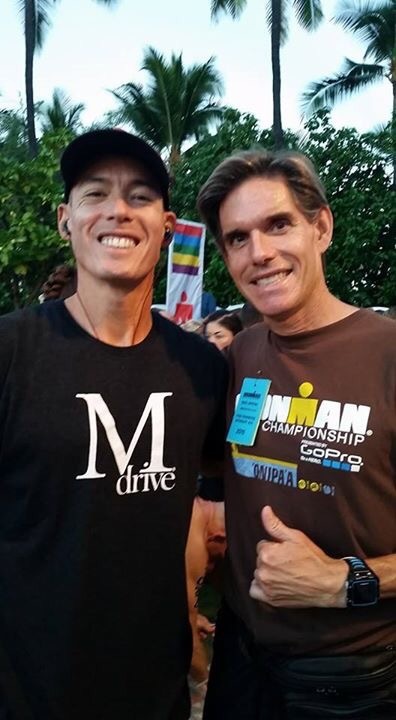 I do get frustrated when I think about my mechanical problem on the bike, but it changes a bit when I learn that my friends Patrick McCrann and Kurt Madden had their share of problems. Coach Patrick broke his toe the night before the race. 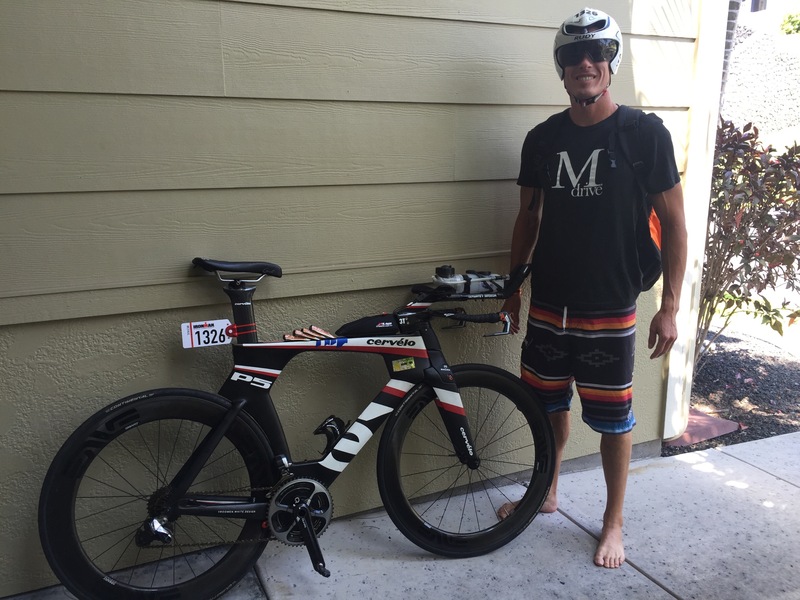 Kurt Madden stepped on a sea urchin the day before the race, and his foot was punctured by the spines (needles). Many remain lodged in his foot. But he still started and finished the race. Coach Patrick not only did the race with a broken toe, but he also beat me by an hour! So I suppose there’s little value in dwelling on what could’ve happened or what should’ve happened. As Keish says, “It’s all part of racing”. 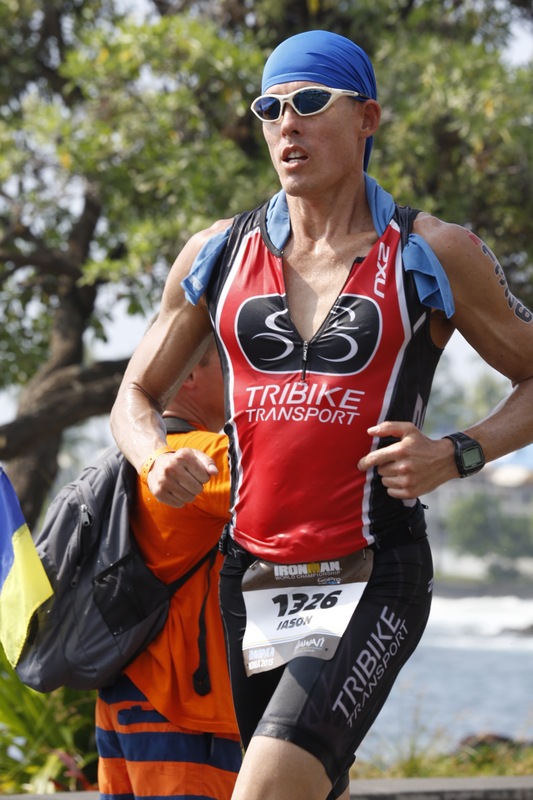 And of course, I think it was Tim Deboom who said: “The perfect Ironman is when only three things go terribly wrong”. I suppose by that definition, I’m ahead of the curve. 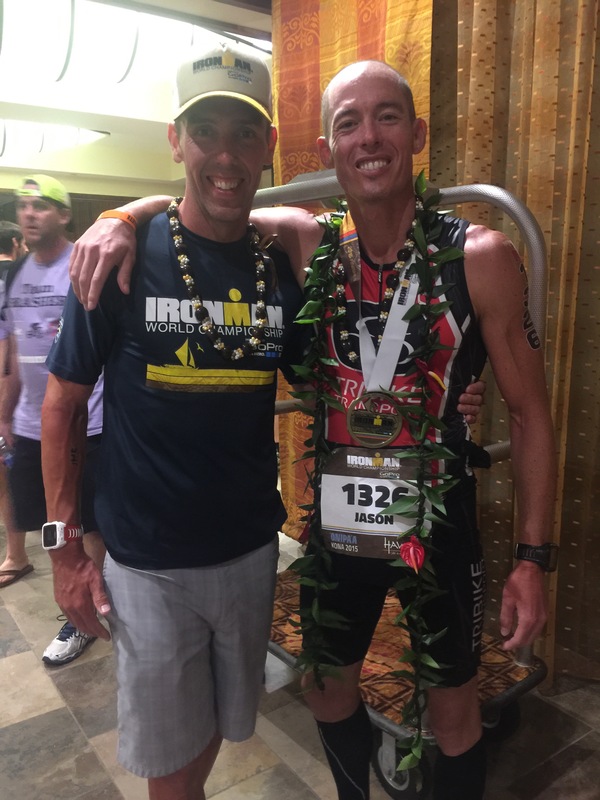 What’s most important, though, is that when I close my eyes, despite what Ironman has contributed to my personal evolution, I don’t see images of the race course. I don’t see the other racers. I don’t feel the pain or see the suffering. I just see friends and family. My friend Conrad helping me reach my nieces. Archrival and friend Coach Patrick. 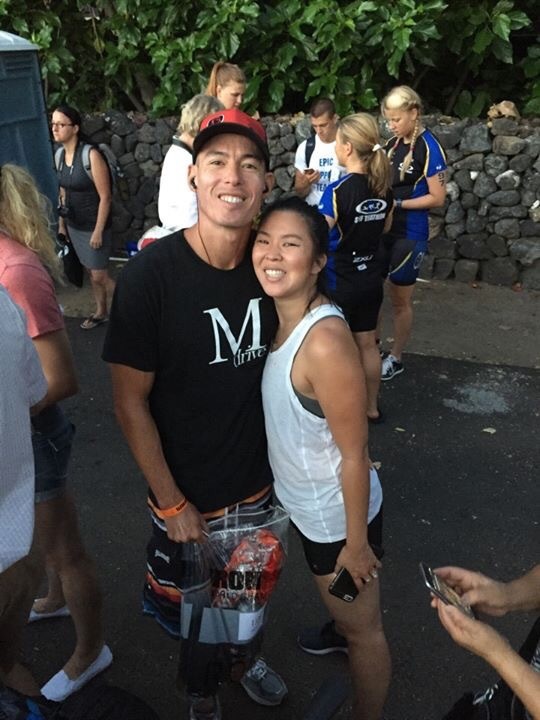 Friend and teammate Keish Doi. My brother, his wife, and their daughters. Having fun with this little rascal. Great read as always Jason! Congratulations! Life is not about the finish line…it’s the journey you took to get there. Haha. Thanks Richard. 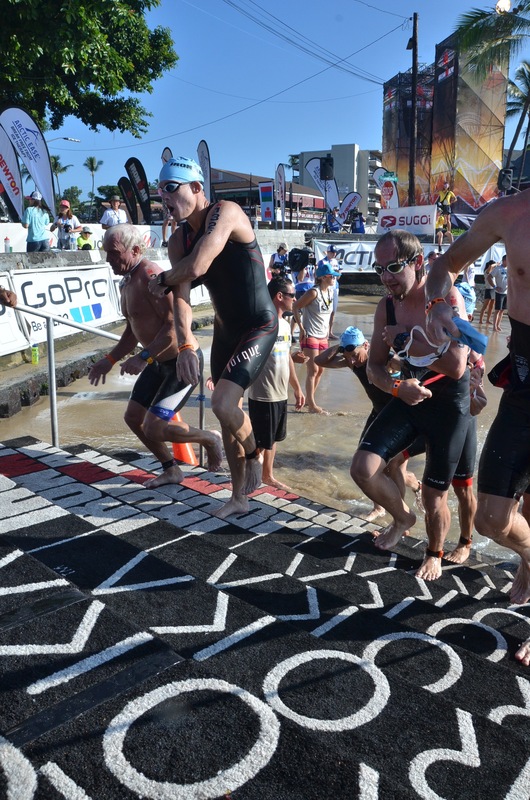 You might be onto something, as there appears to be lots of climbing at IM Malaysia. It might be the perfect course for a fixie. 20 degrees outside. 5 am . I was debating if I could go running with my friend, Chris and go swimming this morning. After reading your report I can’t wait. Thanks Emile! Run well. Enjoy the sunrise.